The Blyth Performing Arts Centre, at Iona College in Havelock North, has scooped the winning pool and been awarded the NZIA 2016 New Zealand Architecture Medal, for best building in the country. For the sake of those of our readers who are not 11-16 year old girls, or who don’t live in Havelock North, the Eye of the Fish made a special visit to Iona – under-cover of course – to snap some exclusive pictures. Well, OK, not exclusive, as you’ve seen it elsewhere, but not with photos by the Fish. Let’s start at the very beginning – its a very good place to start, as Julie Andrews once sang. Doe Ray Me indeed. 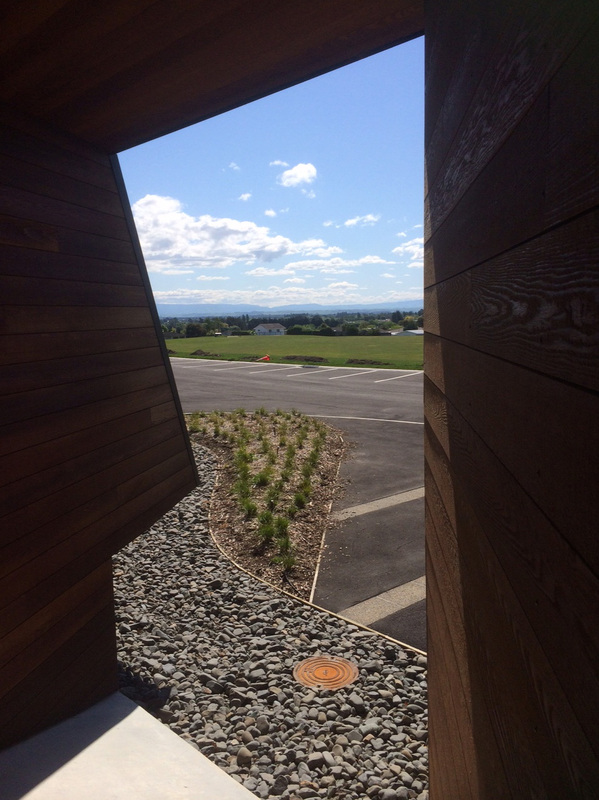 I’ve loved Iona for years, as an example of romantic Hawkes Bay architecture, and it is impossibly beautiful in comparison to my Fish Gutter High School that I frequented as a young snapper. Started by the Presbyterians in 1914, with original buildings designed by architects Rush and James, the assemblage of buildings is a wonderful piece of townscape – almost an Italian hill-town feeling, with a central bell tower, gently colonnaded teaching blocks, all wrapped in a coordinated assemblage of orange Marseille roof tiles, cream plastered / stucco walls, and a blanket of lush green grass and aged trees. Meanwhile, the grounds are crowded with flocks of well-educated young women all clad in green tartan skirts and blazers. 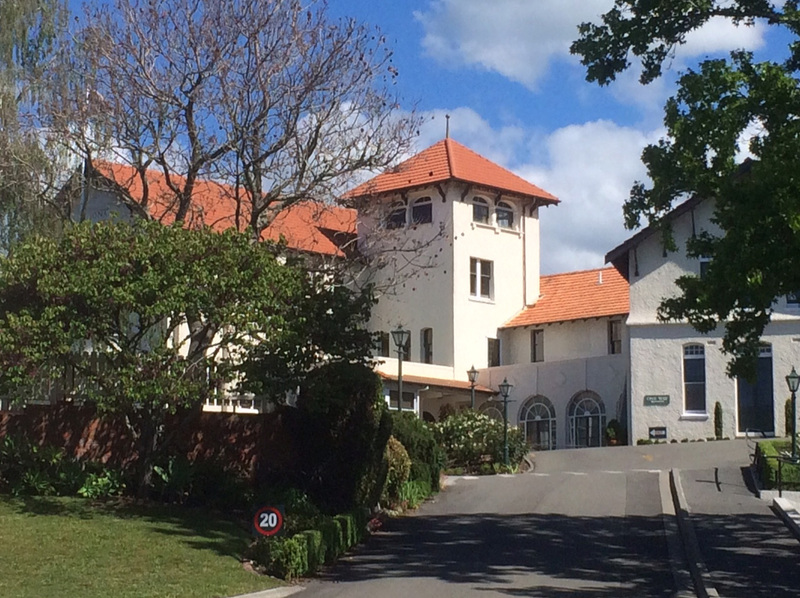 As Scottish as you can get, so far away from Scotland – it is New Zealand’s oldest private girls school, with a gorgeous view out over Hawkes Bay: beautiful in Hawkes Bay as the peach tree blossom is in full bloom. Honest: go there now, this weekend, you won’t see it more beautiful. Truly, the girls that get to go to school, here must be some of the luckiest (architecturally) in the country. Havelock North is like that though: tall, leggy blonde girls in jodpurs doing gymkana, all called Sasha, while Mummy and Daddy wait with Sebastian (the golden labrador) in the RangeRover Evoque Club Sport, as Jeremy and Anthony play cricket nearer the town at Hereworth. No, I’m not jealous, as that is not my scene, and I’m not really in with that crowd, but the girls that get to go to Iona truly are blessed. And now they have another lovely new building to enjoy: the Blyth Performing Arts Centre. The pictures published so far don’t really do it justice – it is better (and a lot bigger!) in the flesh. 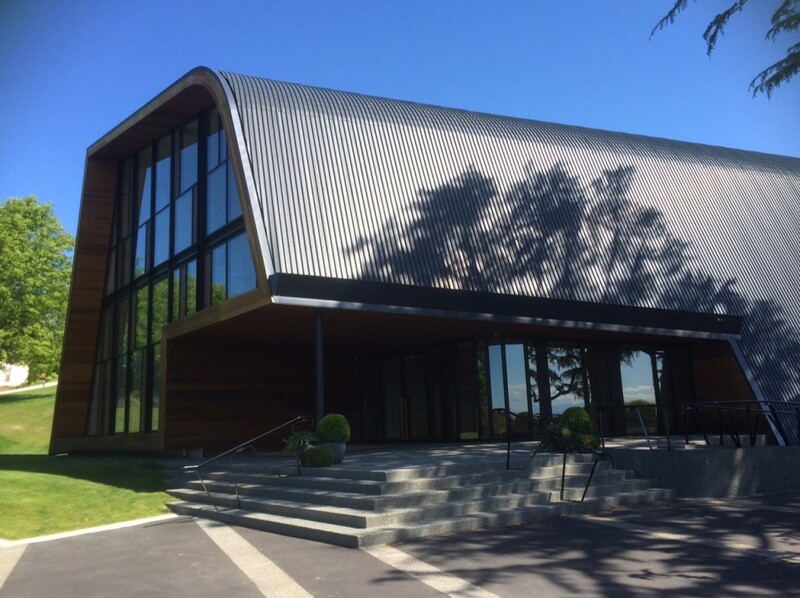 I didn’t manage to get inside, of course, so all i can do is relate to the external envelope – it is certainly a coup for the LongRun steel roofing industry, as that is the vastly predominant material outside – but inside, it is richly timbered. ….which seems to privilege a view out from the stage (so that the headmistress can be bathed in light like a second coming perhaps? ), that looks north to the Titiokura saddle on the Napier-Taupo Road. Is there some deep and symbolic reference here that I am missing? Or is this one glimpse of the outside world enough just to tantalise the girls about the world outside? This is very much a building of the interior, I suspect, no matter how much emphasis is placed on the (rather prominent) exterior. 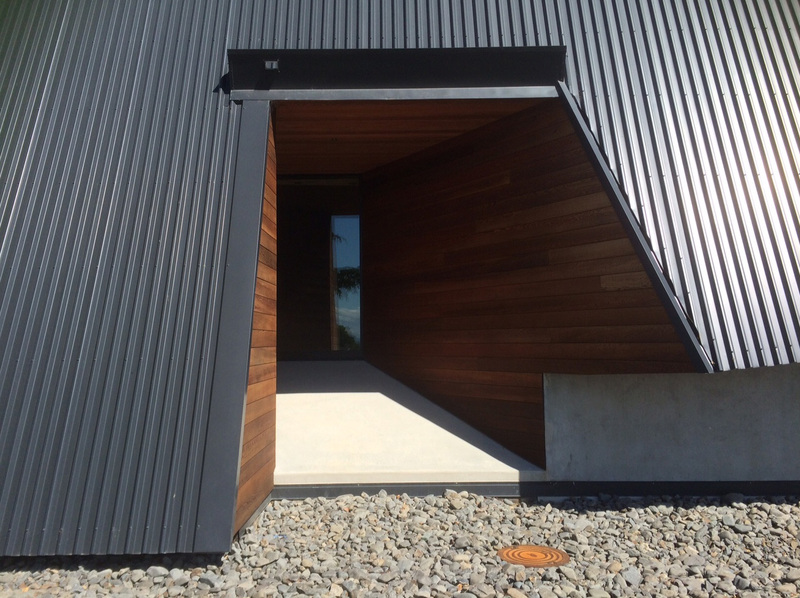 The NZIA’s award commendation talks about the dark and sinuous exterior making reference to nearby Te Mata Peak and the shape of musical instruments – the building will, I think, truly shine out like a beacon at night. 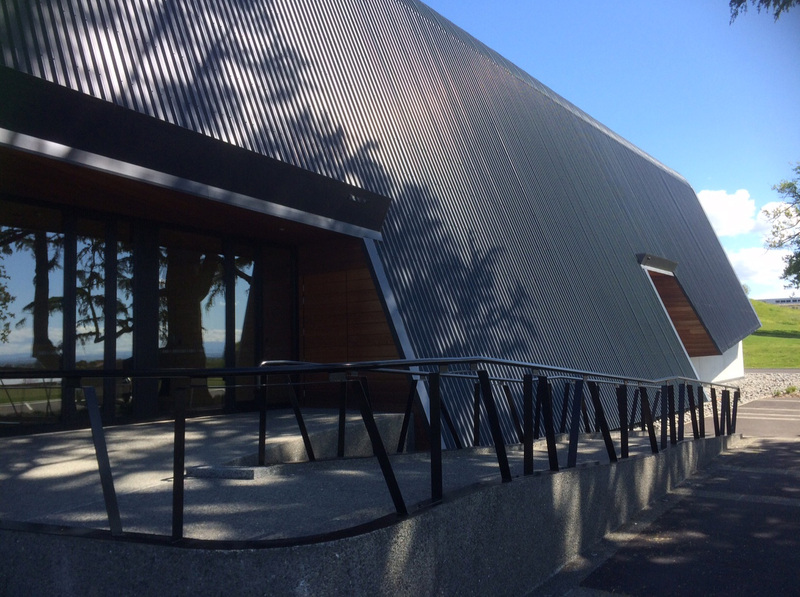 Well done to Stevens Lawson for producing such a delightful building – and here’s hoping that Iona open their new hall to the public so we too can enjoy the interior. 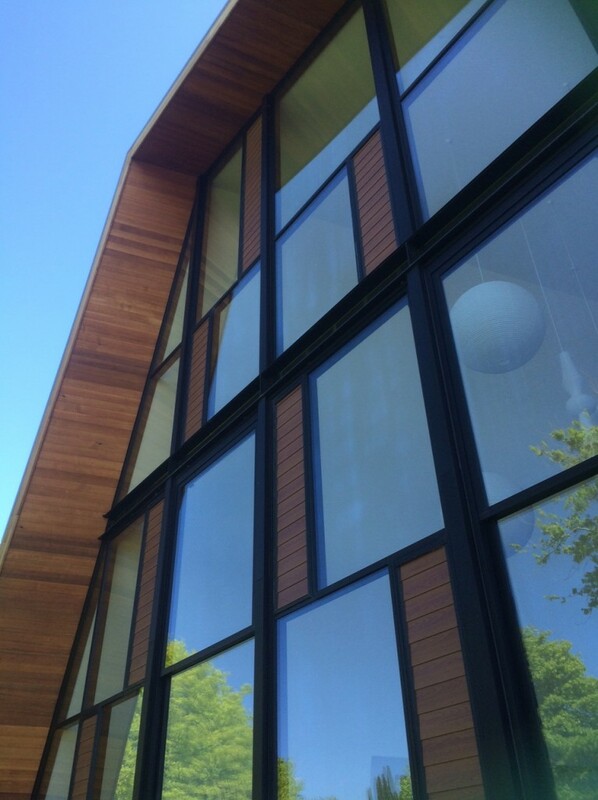 That last photo – timbered panels set into the glass wall. Are they solid or are they openable louvre panels? If indeed they are louvres – how do they get up there to open them? Good question – not sure if they are in fact really Louvres, but that bottom one certainly gives that impression. If indeed they are opening, then it indicates that the building may be at least partially naturally ventilated, and they would probably be on an electrically activated opening mechanism. But their placement all over the facade would seem to say that they are there more for visual appearance, rather than any scientifically planned facade opening? Good questions John H – but of course, Iona girls never misbehave. That’d be the girls at Woodford College (right next door). Boys, of course, are not allowed…. Havelock North does indeed have a (serious?) problem with larrikan youths – who used to congregate at the Happy Tavern (its real name) and occasionally throw bottles at the police. Mummy and Daddy took away the keys to the Cayenne after that. And now the Happy Tav is demolished.